After selling out in 2015 & 2016, the 2017 Ditka Dash is expected to sell out in record time. It is recommended you secure your preferred wave time as early as possible. Once a wave is sold out, we are unable to allow any additional registrations for that wave. There are 3 options for picking up your race packet. A Photo ID and BIB number are needed to pick up your race packet. Find you bib number here. NOTE: Highlighted names need to sign their waiver, we are unable to release your race packet until your waiver is signed. Follow these directions to sign your waiver. Have a friend or family member pick up your packet for you by presenting a copy of your ID and bib number prior to the race (location, dates, and times listed above). Race Day Packet Pick-Up. 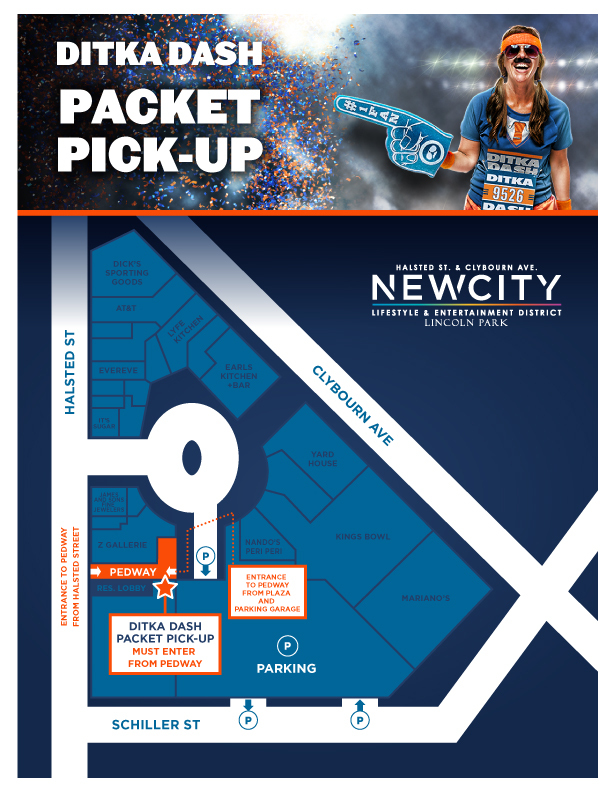 For $10.00 per race packet, you can pick up your packet on race day at the Packet Pick-Up tent before the event, between 7:45am - 9:45am. You can sign up for this service during the registration process. *Please note only those who register for Race Day Packet Pick-Up will be able to pick up their packet on race day. minutes before their wave time. Parking will be available in the North Garage, South Lot, and Waldron Garage for $20. Payment is required as you enter. Click here for the parking map. For more information, please visit www.soldierfieldparking.com. The RTA Travel Information Center provides scheduling information for all CTA, Metra, and Pace services. For information, please call (312) 836-7000 or visit www.rtachicago.com. All taxis and vehicles dropping off participants will be directed by traffic officials to the main Museum Campus visitor entrance on McFetridge Drive or to the 18th Street Metra drop-off. Vehicles should exit Lake Shore Drive at McFetridge Drive or 18th Street, then proceed to the drop-off point. All Ditka Dash participants will receive free race day photos from Gameface Media. Photos will be available the week following the race and emailed to all participants. 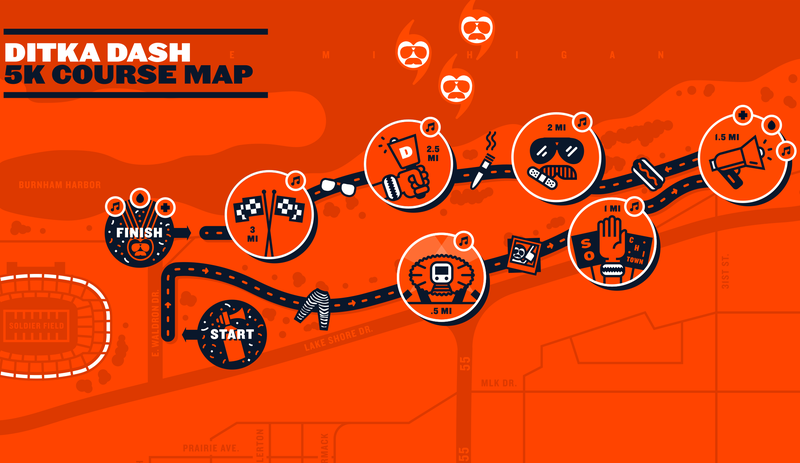 The Ditka Dash will take place rain or shine. In the event of inclement weather, we reserve the right to delay, postpone, or cancel the event. All registrations are nonrefundable and nontransferable. The Ditka Dash is a self-timed event. Timing clocks displaying real time will be provided at the start line and finish line to allow participants to keep track of their time. After finishing the Ditka Dash, celebrate at the Post Race Mustache Bash with ice cold beer, music, and thousands of mustache-clad Ditkas! Dash together. Awesome team name required! Visit the Ditka Teams Page for all you need to know. The dash offers a variety of contests & Awards! A 10% special discount will be given to all members of the US Military, Sheriff Department, Police Department, Fire Department, Teachers, First Responders, Active Duty Dependents, and Veterans. Please email info@ditkadash.com to receive your discount code. Coming Soon! Stay Tuned For Great Training Info To Get You Ready For Da Dash! What’s better than ONE ditka? 7 Ditkas. A division has been created where 7 or more Ditkas can complete the Ditka Dash while connected together. This division is recommended for those who are courageous. Ditka-pede teams must consist of at least 7 Ditkas plus one floater who runs alongside the team, substituting for runners who need to take a cigar break or make a Polish sausage pit stop. There is no limit on the length of a Ditka-pede. All Ditka-pede teams are required to create an official team name. Each Ditka-pede team member must be registered and wear his or her assigned Ditka Dash bib number. Each Ditka-pede team member registers separately. Ditka-pede teams must start connected and finish connected. No Ditka left behind. It is at the discretion of each Ditka-pede team to decide how to stay connected. Creativity is highly encouraged. If a substitution occurs during the dash, the replacement Ditka must give the secret team password (created by each team) in order to complete the substitution. Please note the secret team password must be repeated for all substitutions. All Ditka-pede team members are required to wear a mustache. All lead Ditka-pede team members are required to wear an official Ditka-pede Captain’s armband. If a lead team member substitution occurs, the Captain’s armband must be given to the new lead runner. Captain’s armbands will be distributed to each Ditka-pede team on race day at the Ditka-pede tent. The most outrageous Ditka-pede team will receive the oh-so-sought after “Award for Awesomeness”.